Hi! My name is Amy. I used to blog, but I’ve decided I’m too lazy to really keep up with it, plus I don’t live in Ohio anymore, which maybe defeats the purpose of said blog. While I still believe there are fun things to do in Ohio, mostly it just depresses me to think about them. I’m now the better part of a day’s drive away from home, in a new state, in a new condo-ish thing, with new friends (maybe?) and a new job…. My job is nothing to write home about, since we came out here for the husband’s new exciting job, and I took what I could get, so I wouldn’t be home sitting on the couch with the dogs watching Lifetime movies and eating ice cream. I have never been one to transition well. Luckily, my husband, B, and I have landed ourselves on the banks of heaven. And by that I mean we are in the Finger Lakes Region of New York State… home to a bunch of lakes and a shitload of wineries. Turns out there is a cure for homesickness after all! Now, I am by no means a wine snob**, but I do enjoy learning about it, especially since the learning goes hand in hand with the drink – er.. tasting. As it turns out, the climate here in Western? Upstate? NY is perfect for growing certain types of grapes. Most of these happen to be white varieties, but there are some pretty awesome reds grown here as well. If I would have prepared more, there would be better pictures than the ones of my Labor Day Adventure and other ones found on google images, but I’ve had important things to drink/do lately instead. Let me introduce you to my friend, Cabernet Franc. 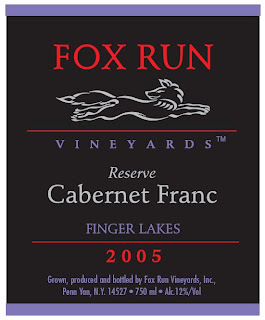 Fox Run is one of my favorite wineries out here, and I could drink this all day long. It tastes like fantastic. Eclipse White, by Heron Hill. It's a delicious white blend, and no, it has nothing to do with vampires. It does come in a pretty bottle, is fairly cheap, and I really want to say it tastes ‘bitey’, but that is just way too much with the vampire stuff, so let’s call it ‘crisp’ instead, shall we? I feel like I should also mention Riesling. This is one of the NYS big guns. Basically, I like them all if they are accompanied by the word “dry”, some of them if they are of the “semi-dry” persuasion, and none of them that call themselves “sweet”, although B really likes them. That's enough for one day, right? *It’s really only one thing, but “things” made for a better title. **I have actually drank Boone’s Farm in recent memory. A memory which also included dancing midgets and a Tim McGraw concert, but that’s another story. ***If you hold yours on your lap. Labels: Amy rules the world. As soon as I can drink again, I'm coming to New York and we're getting wasted. Er, I mean, going wine tasting. I'm going to need some of that when its my turn to guest blog! Will you ship to Arkansas? SB - I don't know about your liquor laws in Arkansas, but UPS is pretty good about the don't ask, don't tell. Loved the post Amy. I'm currently enjoying all the fun of California Reds, but I'm willing to give the NY wines a fighting chance!